Britain’s biggest retailers have torn into Government proposals to extend Sunday trading hours, warning David Cameron that they would damage an already-embattled industry as MPs prepare to vote on the issue. Sky News has learnt that the Prime Minister was “visibly taken aback” by the strength of feeling among high street chiefs who attended a summit in Downing Street last week. The chief executives of J Sainsbury and Tesco, the managing director of John Lewis, and executives from Asda, Dixons Carphone and Marks & Spencer were among those present at the meeting. 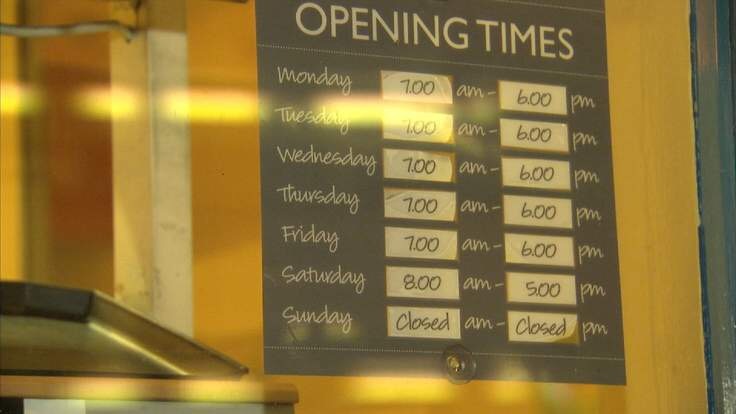 A source said many of the bosses expressed anger at the Government’s approach to extending Sunday shop opening hours, arguing that the increase in their fixed costs – through higher wage bills and other overheads – would be covered by incremental revenues. Another source said that Mr Cameron “appeared not to have been adequately briefed” about the industry’s concerns. “He should not have been as surprised as he looked,” they said. “He appeared to be visibly taken aback”. Andy Street, John Lewis’ managing director, is said to have been among those who criticised the Government’s handling of the reforms during the meeting with Mr Cameron. In 2005, Mr Street – then John Lewis’s personnel director – wrote to staff saying that the group would support any move to extend the legal window of Sunday trading. Whitehall insiders said Sainsbury’s and others had written to Sajid Javid, the Business Secretary, in recent weeks opposing the Government’s plans, which would give local authorities in England and Wales the discretion to decide on large stores’ Sunday trading hours. Sainsbury’s is among the major retailers which have questioned whether there is an appetite among consumers or retail-workers for the changes. Wednesday’s Commons vote hangs in the balance after the Scottish National Party said its MPs would vote against the reforms because shop-workers north of the border could see their wages affected even though the longer Sunday opening would not apply there. Scores of council leaders in England have backed the devolution of decision-making power, arguing that it will give local high streets greater flexibility to compete with the ubiquitous nature of online retailing. The Commons vote comes at a brittle time for relations between the Government and big high street employers, with the British Retail Consortium warning last month that 900,000 jobs – a third of today’s total – could disappear from the sector over the next decade amid a cocktail of rising costs and greater competition. Retailers have been angered by the planned introduction of the National Living Wage and the apprenticeships levy even as business rates remain stubbornly high. They have also been pressed by Downing Street officials to back the campaign for the UK to stay in the European Union, but many have refused, saying they will remain neutral ahead of the referendum. None of those who attended the meeting would comment. Posted on March 15, 2016, in Other. Bookmark the permalink. Leave a comment.